Citation: Ito A, Aoyama T, Yoshizawa M, Nagai M, Tajino J, Yamaguchi S, Iijima H, Zhang X, Kuroki H. The effects of short-term hypoxia on human mesenchymal stem cell proliferation, viability and p16INK4A mRNA expression: Investigation using a simple hypoxic culture system with a deoxidizing agent.J Stem Cells Regen Med. 2015; 11(1):25-31. A hypoxic environment is thought to be important for the maintenance of stemness and suppressing cell senescence, in stem cells. Therefore, a hypoxic condition is induced during cell expansion and/or induction of intended differentiation. However, the induction of these conditions requires a specially equipped hypoxia chamber and expensive gas mixtures, which are expensive and space-consuming. Owing to these restrictions, appropriate hypoxic conditions cannot be provided during cell transportation, which is increasingly required for regenerative medicine. Hence, a simple and economical culture system is required. The purpose of this study was to investigate the effects of short-term hypoxic conditions on human mesenchymal stem cell (MSC) proliferation, viability, and senescence, utilizing the CulturePal system (CulturePal-Zero and CulturePal-Five), a novel and simple hypoxic culture system with a built-in deoxidizing agent. The O2 concentration in the CulturePal-Zero was observed to reduce to <0.1% within 1 h, and to 5% within 24 h in the CulturePal-Five system. 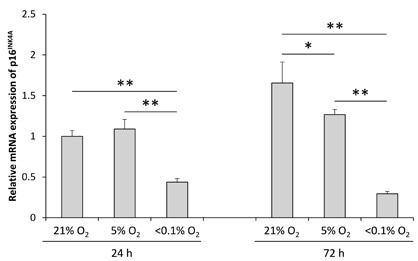 Cell proliferation under these hypoxic conditions showed a sharp increase at 5% O2 concentration, and no noticeable cell death was observed even at severe hypoxic conditions (<0.1% O2) up to 72h. The p16INK4A (cell senescence marker) mRNA expression was retained under hypoxic conditions up to 72h, but it was up-regulated under normoxic conditions. Interestingly, the p16INK4A expression altered proportionately to the O2 concentration. These results indicated that the short-term hypoxic condition, at an approximate O2 concentration of 5%, would be suitable for promoting cell proliferation and repressing cell senescence, without aggravating the MSC viability. Therefore, the CulturePal systems may be suitable for providing an appropriate hypoxic condition in stem cell research and transportation. Under in vivo conditions, stem cellsexist in a hypoxic environment, which is thought to be an important factor for the maintenance of its phenotype . In addition, in vitro cell culture exposed to normoxiais subjected to oxidative stress, and causes cell senescence . Therefore, to maintain stemness and avoid oxidative stress, the use of a hypoxic culture, resembling in vivo environments, has been recommended [3, 4]. Mesenchymal stem cells (MSCs) are somatic stem cells, and are promising candidates for applications in cell therapies due to their multipotency and immunotolerance [5, 6]. Hypoxic conditions have been previously reported to promote MSC proliferation [7–9], maintain the undifferentiated state of the cell [9–11], and induce differentiated state when cultivated under differentiative culture conditions . In addition, hypoxic conditions have been shown to suppress cell senescence [9, 12]. However, there have been contrasting reports stating that the hypoxic conditions exert little effect on cell proliferation or induction of differentiation [11, 13, 14]. Therefore, the effect of hypoxia on MSCs remains controversial, necessitating further research. However, it is clear that the regulation of gas concentrations, such as that of oxygen (O2) and carbon dioxide (CO2), is an essential parameter for the modulation of cell phenotype and metabolism. In general, hypoxic conditions are induced by exchanging atmospheric air with a gas mixture (95% N2/5% CO2) within a specially equipped hypoxia chamber. However, such equipment is expensive and requires a lot of space, when several gas concentrations and/or other conditions are investigated simultaneously. With the development in regenerative medicine there has arisen an increasing need for an effective cell transportation protocol, in order to deliver manufactured cells such as stem cells and primary cells to patients. Although the use of appropriate gas conditions are considered important to maintain or improve cell quality, its regulation is quite cumbersome because it requires the use of complicated equipment. Therefore, the control of cell quality by the regulation of gas conditions during transportation is still a difficult process. To overcome these issues, a simple culture system that does not require gas incubators and gas cylinders must be developed. The AnaeroPack (Mitsubishi Gas Chemical Company Inc., Tokyo, Japan) and the AnaeroGen (Oxoid, Basingstoke, United Kingdom) systems are currently being applied for the simple cultivation of anaerobes , or to induce hypoxic injury in mammalian cells [16, 17]. However, these systems have been unable to control and modulate the O2 concentration in mammalian cell cultivations, although some methods have been reported where the AnaeroPack system has been applied for the induction of hypoxic conditions [18, 19]. The CulturePal system (Trial Products; Mitsubishi Gas Chemical Company Inc.) is a novel gas concentration regulating reagent for the induction of a hypoxic atmosphere. This reagent contains sodium ascorbate as the principal constituent, which absorbs O2 and generates CO2 by oxidative degradation, as well as a CO2 absorber to control the CO2 levels. Two series of the CulturePal system have been developed—the CulturePal-Zero and CulturePal-Five. CulturePal-Zero is designed to modulate the O2 and CO2 concentration levels to <0.1% and 3–7%, while the CulturePal-Five regulates the concentration to 3–7% and 3–7%, respectively. We hypothesized that the CulturePal systems would be a suitable and simple system providing short-term hypoxic conditions, and for the regulation of gas concentrations during cell transportation. However, the capacity of this system to induce hypoxic responses, replicating the results obtained in a conventional gas atmosphere-controlling chamber, remains to be tested. Therefore, the purpose of this study was to investigate the effects of short-term hypoxic conditions induced by the CulturePal hypoxic culture system with a built-in deoxidizing agent, on MSC proliferation, viability, and senescence. The general procedure for use of the CulturePal system is as demonstrated in Figure 1. The foil package was opened (Figure 1A), the reagent placed in an air-tight jar containing the culture (Figure 1B), and the lid closed immediately (Figure 1C). The reagent is activated upon contact with air, and the hypoxia is initiated (Figure 1D). In order to assess the time-lapse changes in O2 and CO2 concentration under hypoxia conditions induced by the CulturePal-Zero and CulturePal-Five systems, the reagents were placed in a 2.5-L airtight jar (Mitsubishi Gas Chemical Company Inc.) each. The O2 and CO2 concentrations were measured at 1, 4, 24, 72, and 168h after induction of hypoxia using a CheckMate II (PBI-Dansensor A/S, Ringsted, Denmark). The experiments were repeated four times. 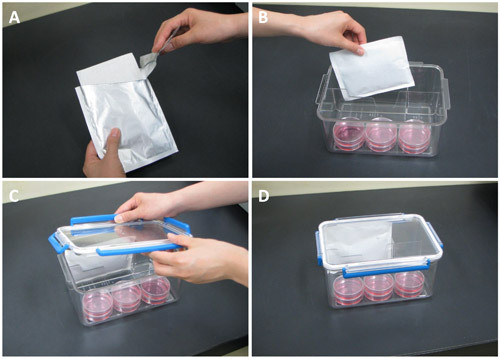 Figure 1: Use of the CulturePal system for hypoxial cell culture (A) The foil package was opened, and (B) placed in the airtight jar containing the culture medium. (C) The lid was then closed immediately. (D) The hypoxia was initiated in this culture system. Human MSCs derived from the bone marrow were purchased from PromoCell (C-12974; Heidelberg, Germany) and expanded in MEM alpha + GlutaMAX medium (Gibco [Life Technologies], Carlsbad, CA, USA) supplemented with 10% fetal bovine serum (Hyclone [Thermo Fisher Scientific], Waltham, MA, USA), 50 U/mL penicillin and 50 μg/mL streptomycin (Nacalai Tesque Inc., Kyoto, Japan). The culture was incubated in a CO2 incubator (95% air atmosphere, 5% CO2, 37°C, and 95% humidity: defined normoxia) up to the third or fourth passage. The medium was changed at 3-day intervals. Following the third/fourth passage, the culture plates or dishes were placed in a 2.5-L airtight jar with CulturePal-Zero, CulturePal-Five (hypoxia), or without the CulturePal reagent (normoxia). The lid of the airtight jar was closed immediately, except for that of the normoxia sample. These jars were placed in the CO2 incubator and incubated for 24 or 72h. The cell cultures in some of the culture dish samples were observed under a phase-contrast microscope (OLYMPUS, Tokyo, Japan) in order to observe the morphological changes in the cell. The MSCs were harvested from the culture dishes using phosphate buffer saline (PBS) with 0.25% trypsin and 0.02% ethylene diamine tetraacetic acid (EDTA). These were then re-seeded on 96-well culture plates at a density of 5.0 × 103 cells/well (n = 15 wells/group). The cells were pre-cultured in normoxia for 20h. Subsequently, the culture plates were exposed to hypoxia for 24 or 72h using the procedure described in the previous section. The cell count was quantified using the cell counting kit-8 (Dojindo Molecular Technologies, Rockville, USA), according to manufacturer’s instructions. Briefly, 10 µL of the cell counting kit-8 solution was added to each well, and the plate included for 2h in the CO2 incubator. The absorbance was measured at 450 nm using a microplate reader (Multiskan FC Microplate Photometer; Thermo Fisher Scientific). The MSCs were re-seeded on 35 mm glass-bottom culture dishes (CELLview Glass Bottom Dish; Greiner Bio-One Co. Ltd., Tokyo, Japan) at a seeding density of 1.0 × 104 cells/well, and pre-cultured at normoxia for 20h. Subsequently, the culture dishes were exposed to hypoxia conditions using the procedure described in the previous section. Cell viability was assessed using a LIVE/DEAD Viability/Cytotoxicity Assay Kit (Life Technologies), as per the manufacturer’s instructions, 24 or 72h after induction of hypoxia. Briefly, the cells were washed twice with PBS, and treated with 0.5 µM of calcein AM and 4µM of ethidium bomodimer-1 (EthD-1) for 30 min at room temperature. The live cells, labeled with calcein AM, produce a green fluorescence, whereas the dead cells, labeled with EthD-1, fluoresce a red color. The labeled cells were observed under a fluorescence microscope (FluoView FV10i; OLYMPUS), and the live (green) and dead (red) cells from 16 views (1272.8 µm × 1272.8 µm/view) were counted from four wells per group. Cell viability was calculated as the proportion of the number of the live cells to the total number of cells counted. The MSCs were re-seeded on 60 mm culture dishes at a density of 3.0 × 105 cells/well (n = 3 wells/group), and pre-cultured in normoxia conditions for 2 days. Subsequently, the culture dishes were exposed to hypoxia using the procedure detailed in the previous section. At 24 or 72h after induction of hypoxia, the total RNA was extracted using the RNeasy Mini Kit, according to the manufacturer’s protocol (Qiagen, Limburg, Netherlands). The purity of the extracted RNA was tested using the NanoDrop2000 (Thermo Fisher Scientific). The total RNA (1 µg) was reverse-transcribed to synthesize cDNA. A real-time quantitative polymerase chain reaction (qRT-PCR) was performed on the Applied Biosystems 7500 Real-Time PCR System (Life Technologies) using the commercially available, TaqMan gene expression assays (Life Technologies): the p16INK4A (Hs00923894_m1), and eukaryotic 18S rRNA (18S: Hs03003631_g1). Standardized enzyme and cycling conditions developed for the 7500 Real-Time PCR System were used for PCR cycling. 18S was used as the control housekeeping gene. Template cDNA, corresponding to 10 ng of RNA, was added to each PCR reaction mix, and all biological samples were run in technical duplicates, for each gene. The data obtained by qRT-PCR was analyzed by the comparative threshold cycle method. Briefly, the quantity of p16INK4A was normalized to that of 18S, the value of the calibration sample (the cells cultured in normoxia for 24h) was set to 1, and the values for each of the other conditions were determined relative to that of the calibration sample. All values are presented as mean ± standard deviation. Statistical significance was determined by one-way analysis of variance, with the post-hoc multiple comparison Tukey-Kramer test. The differences observed were considered significant if the p value was less than 0.05. 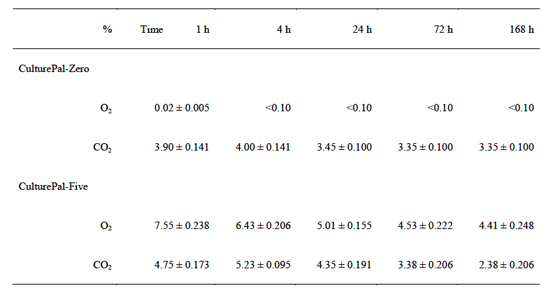 The O2 and CO2 concentrations (mean ± standard deviation) are displayed in Table 1. 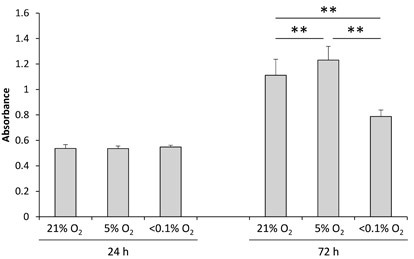 The O2 concentration in the CulturePal-Zero system was observed to drop to less than 0.1% within 1h, and was maintained up to 168h after hypoxia induction (Figure 2A). The O2 concentration in the CulturePal-Five system dropped to approximately 7.6% within 1h, 6.4% in 4h, and reached 5% 24h-post incubation (Figure 2B). This was maintained until 168h after hypoxia induction. The CO2 concentration in this system rose to approximately 4.8% and 5.2% within 1 and 4h, respectively, gradually dropping to approximately 4.4% at 24h, 3.9% within 72h, and 2.4% at 168h after hypoxia induction (Figure 2B). Based on these results, we classified O2 conditions as follows: normoxia, 21% O2; CulturePal-Five, 5% O2; and CulturePal-Zero, <0.1% O2. 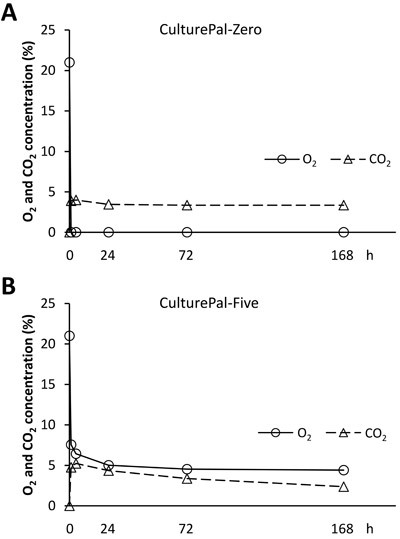 Figure 2 – Changes in the O2 and CO2 concentrations in the hypoxial culture jar Changes in O2 and CO2 concentrations in the (A) CulturePal-Zero and (B) Culture-Pal-Five hypoxial culture systems. Circles represent O2 concentration; triangles represent CO2 concentration. Values are presented as mean of four independent experiments. The MSCs displayed a fibroblast-like morphology at all conditions, 24h after the induction of hypoxia (Figure 3). On the other hand, 72h after hypoxia induction, the MSCs exposed to <0.1% O2 displayed morphological alterations such as a rounded shape. No apparent morphological changes were seen in the cells maintained in 21% O2 and 5% O2 conditions (Figure 3). Figure 3 –Cell morphological changes at different O2 concentrations Scale bar = 20 µm; magnification, ×40. No significant differences were observed in the cell proliferation pattern between the groups, 24h after hypoxia induction (Figure 4). The MSC cell count increased in all groups at 72h. A comparison of cell counts between the groups at 72h revealed that 5% and <0.1% O2 conditions resulted in the highest and lowest cell counts, respectively (Figure 4). Figure 4 – Cell proliferation at different O2 concentration states Values are presented as mean ± standard deviation (n = 15 wells/group; **P < 0.01). The cell morphology was visualized by calcein AM staining (green). We observed a shrunken shape in the cells incubated at <0.1% O2 conditions, 72h after the induction of hypoxia (Figure 5A). However, the cell viability at 24 and 72h was observed to be very high (over 94%) even under <0.1% O2 conditions. However, cells cultured at <0.1% O2 conditions were slightly, but significantly less viable than those cultured in 21% O2, 72h post-induction (p < 0.05, Figure 5B). Figure 5 –Cell viability at different O2 concentrations (A) Representative images from the LIVE/DEAD viability assay. Live cells display green fluorescence, while the dead cells appear red in color. (B) Percentage of cell viability seen at different O2 conditions. Values are presented as mean ± standard deviation (n = 16 views/group; *P < 0.05). At 24h after the induction of hypoxia, p16INK4A mRNA expression was observed to be significantly down-regulated in <0.1% O2, compared to 21% O2 and 5% O2 culture conditions (Figure 6). The p16INK4A expression was higher when cultured for 72h in 21% O2, when compared to the 24h incubation. However, the mRNA expression maintained a similar level when incubated at 5% O2 and <0.1% O2 for different time intervals. A comparison between the groups at 72h post-induction of hypoxia revealed the significant down-regulation of p16INK4A expression proportional to the decrease in O2 concentration (Figure 6). Figure 6 – Expression of p16INK4A mRNA at different O2 concentrations.Values are presented as mean ± standard deviation (n = 3 wells/group; *P < 0.05, **P < 0.01). In this study, we employed the CulturePal trial reagents for the simple induction of hypoxic conditions, and investigated the time-lapse changes in O2 and CO2 concentrations in the systems. Furthermore, we also investigated the effects of short-term hypoxia on human MSC proliferation, viability, and p16INK4A mRNA expression, by utilizing the CulturePal systems. The CulturePal-Zero was able to induce severe hypoxia (<0.1% O2) within 1h, which was maintained at least up to 168h. The CulturePal-Five system showed a drop in O2 concentration down to approximately 5% within 24h, which was maintained up to 168h. The CO2 concentration was also regulated to 3–5%, between 1h and 72h post-induction, in both systems. Simultaneous investigations utilizing several different gas concentrations necessitate an equivalent number of CO2 incubators. Additionally, when other conditions such as culture temperature are altered, more incubators are required. In the case of investigations requiring a heat or cold shock stimulus, which is provided by a temperature-controlled water baths, the containers have to be hermetically sealed in order to prevent contaminations. This can cause alteration in the chamber gas concentrations. Therefore, control of the gas concentration within the container is imperative, although difficult. These issues could be overcome by application of the CulturePal systems as a single unit can be used for simultaneous investigations at three different O2 conditions (21%, 5%, and <0.1% O2). In addition, if the experiment requires 5% O2 or <0.1% O2 environment only, a conventional thermal incubator can be used for incubation, dispensing the need for expensive gas chambers and incubators. Based on these observations, we conclude that, although the CulturePal systems cannot be used to maintain a standard gas concentration during a culture medium exchange, it could be efficiently used to provide short-term hypoxic conditions or hypoxic stress. This system is also suitable for cell transportation, as a gas-atmosphere regulating reagent. In our experiment, the rate of proliferation of MSCs was observed to be highest in 5% O2 and the lowest in <0.1% O2 conditions (Figure 4). These results are consistent with those of previous studies, where physiological hypoxia was observed to enhance MSC proliferation[7–9]. We also evaluated the cell viability at the three gas concentrations, and discovered that MSCs could maintain their viability even at <0.1% O2 concentration conditions up to 72h after induction of hypoxia (Figure 5B), although some morphological alterations were observed (Figure 3), and the proliferative ability was observed to decrease under these severely hypoxic conditions (Figure 4). These results are also consistent with those of previous studies[17, 20, 21] where MSCs were reported to withstand severe hypoxia (<1% O2) for at least 48h by increasing the availability of glucose, which facilitates the generation of energy under limited O2 availability conditions. Therefore, MSCs, which are extremely durable under hypoxic conditions, could be utilized in cell therapies. Cell senescence occurs in primary cellswith long-term in vitro cultivation as a result of telomere shortening, oxidative stress, DNA damage, and aberrant mitogenic signaling. The senescent cells demonstrated decreased cell proliferation and differentiation abilities, which decreased their potential for tissue regeneration. Hence, it is important to prevent cell senescence during cell culture and transportation. p16INK4A is a well-known marker for cell senescence, as well as a tumor suppressor gene. It has been reported that the down-regulation of p16INK4A mRNA expression resulted in a decrease in senescence, and restoration of the proliferative activity. Our results have shown retained p16INK4A expression up to 72h at 5% O2 and <0.1% O2 conditions, demonstrating the reduced cell senescence characteristics. p16INK4A was up-regulated at 21% O2 conditions, indicating an induction of cell senescence. Therefore, we demonstrated that a hypoxic condition prevents the induction of cell senescence, which is consistent with the results of previous studies using O2 concentration-controlled chamber[9, 12]. Furthermore, p16INK4A expression was significantly down-regulated in <0.1% O2 conditions compared to that in 5% O2 conditions, indicating that the repression of p16INK4A expression by hypoxic stimulus is correlated with the O2 concentration. To the best of our knowledge, ours is the first study reporting this phenomenon. Therefore, we suggest that 5% O2 concentration conditions would be suitable for maintenance of MSC quality. In addition, we have confirmed that this hypoxic culture system could easily replicate the experiments, using a short-term gas concentration-controlled chamber. We have, however, identified two limitations in this study. First, the actual gas concentrations within the culture medium could not be measured. The O2 has to diffuse through the culture medium to reach the cells, which causes lower O2 tension near the cell surface compared to that controlled in the gas phase. Second, our experiments were conducted on commercially available cells. It is important to confirm the reproducibility of our study results in cells obtained from individuals, and from different pathological states. A short-term hypoxic condition induced at 5% O2 concentration promotes cell proliferation and represses up-regulation of the p16INK4A expression, without aggravating the cell viability of human MSCs. Furthermore, the mRNA expression of cell senescence marker p16INK4A might be altered proportionally to O2 concentration. Finally, we believe the CulturePal systems are suitable for providing an appropriate hypoxic condition for stem cell research and stem cell transportation. This study was supported partly by MITSUBISHI GAS CHEMICAL COMPANY, INC., 5-2, Marunouchi 2-chome, Chiyoda-ku, Tokyo 100-8324, JAPAN, a Grant-in-Aid for Japan Society for the Promotion of Science (JSPS) Research Fellows (no. 25-3611), a JSPS KAKENHI Grant-in-Aid for Scientific Research (A) (no. 25242055), and a JSPS KAKENHI Grant-in-Aid for Challenging Exploratory Research (no. 25560258), 5-3-1 Kojimachi, Chiyoda-ku, Tokyo 102-0083, JAPAN. Makoto Yoshizawa is a chief engineer of R & D center, Information and Advanced Materials Company, MITSUBISHI GAS CHEMICAL COMPANY, INC.
Hawkins KE, Sharp TV, McKay TR. The role of hypoxia in stem cell potency and differentiation. Regen. Med. 2013; 8(6): 771–782. Passos JF, Von Zglinicki T. Oxygen free radicals in cell senescence: are they signal transducers? Free Radic. Res. 2006; 40(12): 1277–1283. Csete M. Oxygen in the cultivation of stem cells. Ann. N. Y. Acad. Sci. 2005; 1049: 1–8. Ma T, Grayson WL, Fröhlich M, Vunjak-Novakovic G. Hypoxia and stem cell-based engineering of mesenchymal tissues. Biotechnol. Prog. 2009; 25(1): 32–42. 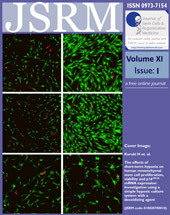 Pittenger MF, Mackay AM, Beck SC, Jaiswal RK, Douglas R, Mosca JD, Moorman MA, Simonetti DW, Craig S, Marshak DR. Multilineage potential of adult human mesenchymal stem cells. Science. 1999; 284(5411): 143–147. Aggarwal S, Pittenger MF. Human mesenchymal stem cells modulate allogeneic immune cell responses. Blood. 2005; 105(4): 1815–1822. Lennon DP, Edmison JM, Caplan AI. Cultivation of rat marrow-derived mesenchymal stem cells in reduced oxygen tension: effects on in vitro and in vivo osteochondrogenesis. J Cell Physiol. 2001; 187(3): 345–355. Grayson WL, Zhao F, Bunnell B, Ma T. Hypoxia enhances proliferation and tissue formation of human mesenchymal stem cells. Biochem. Biophys. Res. Commun. 2007; 358(3): 948–953. Tsai CC, Chen YJ, Yew TL, Chen LL, Wang JY, Chiu CH, Hung SC. Hypoxia inhibits senescence and maintains mesenchymal stem cell properties through down-regulation of E2A-p21 by HIF-TWIST. Blood. 2011; 117(2): 459–469. Grayson WL, Zhao F, Izadpanah R, Bunnell B, Ma T. Effects of hypoxia on human mesenchymal stem cell expansion and plasticity in 3D constructs. J. Cell Physiol. 2006; 207(2): 331–339. D'Ippolito G, Diabira S, Howard GA, Roos BA, Schiller PC. Low oxygen tension inhibits osteogenic differentiation and enhances stemness of human MIAMI cells. Bone. 2006; 39(3): 513–522. Jin Y, Kato T, Furu M, Nasu A, Kajita Y, Mitsui H, Ueda M, Aoyama T, Nakayama T, Nakamura T, Toguchida J. Mesenchymal stem cells cultured under hypoxia escape from senescence via down-regulation of p16 and extracellular signal regulated kinase. Biochem. Biophys. Res Commun. 2010; 391(3): 1471–1476. Hung SC, Pochampally RR, Hsu SC, Sanchez C, Chen SC, Spees J, Prockop DJ. Short-term exposure of multipotent stromal cells to low oxygen increases their expression of CX3CR1 and CXCR4 and their engraftment in vivo. PLoS One. 2007; 2(5): e416. Tamama K, Kawasaki H, Kerpedjieva SS, Guan J, Ganju RK, Sen CK. Differential roles of hypoxia inducible factor subunits in multipotential stromal cells under hypoxic condition. J. Cell Biochem. 2011; 112(3): 804–817. Delaney ML, Onderdonk AB. Evaluation of the AnaeroPack system for growth of clinically significant anaerobes. J. Clin. Microbiol. 1997; 35(3): 558–562. Kamiya T, Kwon AH, Kanemaki T, Matsui Y, Uetsuji S, Okumura T, Kamiyama Y. A simplified model of hypoxic injury in primary cultured rat hepatocytes. In Vitro Cell Dev. Biol. Anim. 1998; 34(2): 131–137. Potier E, Ferreira E, Meunier A, Sedel L, Logeart-Avramoglou D, Petite H. Prolonged hypoxia concomitant with serum deprivation induces massive human mesenchymal stem cell death. Tissue Eng. 2007; 13(6): 1325–1331. Kaida A, Miura M. Differential dependence on oxygen tension during the maturation process between monomeric Kusabira Orange 2 and monomeric Azami Green expressed in HeLa cells. Biochem. Biophys. Res. Commun. 2012; 421(4): 855–859. Itoi F, Tokoro M, Terashita Y, Yamagata K, Fukunaga N, Asada Y, Wakayama T. Offspring from mouse embryos developed using a simple incubator-free culture system with a deoxidizing agent. PLoS One. 2012; 7(10): e47512. Potier E, Ferreira E, Andriamanalijaona R, Pujol JP, Oudina K, Logeart-Avramoglou D, Petite H. Hypoxia affects mesenchymal stromal cell osteogenic differentiation and angiogenic factor expression. Bone. 2007; 40(4): 1078–1087. 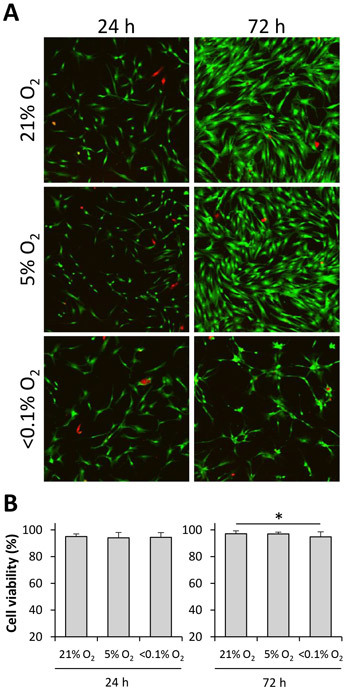 Mylotte LA, Duffy AM, Murphy M, O'Brien T, Samali A, Barry F, Szegezdi E. Metabolic flexibility permits mesenchymal stem cell survival in an ischemic environment. Stem Cells. 2008; 26(5): 1325–1336. Itahana K, Campisi J, Dimri GP. Mechanisms of cellular senescence in human and mouse cells. Biogerontology. 2004; 5(1): 1–10. Kim J, Kang JW, Park JH, Choi Y, Choi KS, Park KD, Baek DH, Seong SK, Min HK, Kim HS. Biological characterization of long-term cultured human mesenchymal stem cells. Arch. Pharm. Res. 2009; 32(1): 117–126. Shibata KR, Aoyama T, Shima Y, Fukiage K, Otsuka S, Furu M, Kohno Y, Ito K, Fujibayashi S, Neo M, Nakayama T, Nakamura T, Toguchida J. Expression of the p16INK4A gene is associated closely with senescence of human mesenchymal stem cells and is potentially silenced by DNA methylation during in vitro expansion. Stem Cells. 2007; 25(9): 2371–2382. Fink T, Abildtrup L, Fogd K, Abdallah BM, Kassem M, Ebbesen P, Zachar V. Induction of adipocyte-like phenotype in human mesenchymal stem cells by hypoxia. Stem Cells. 2004; 22(7): 1346–1355.